Top Seattle Mariners prospect Alex Jackson homered in his return to the Clinton LumberKings on Thursday. That’s already more homers than he hit for the LumberKings last year. Jackson — Baseball America‘s High School Player of the Year in 2014 — started the 2015 season with the LumberKings, but struggled in the Midwest League, batting only .157 with no home runs and 13 RBI in 28 games. He was sent to extended spring training (where he started this season) before finishing the 2015 campaign with the Everett AquaSox of the short-season Northwest League, where he batted .239 with 8 HR and 25 RBI in 48 games. He gets a fresh start this year, and his solo homer Thursday was a good way to mark a new beginning. 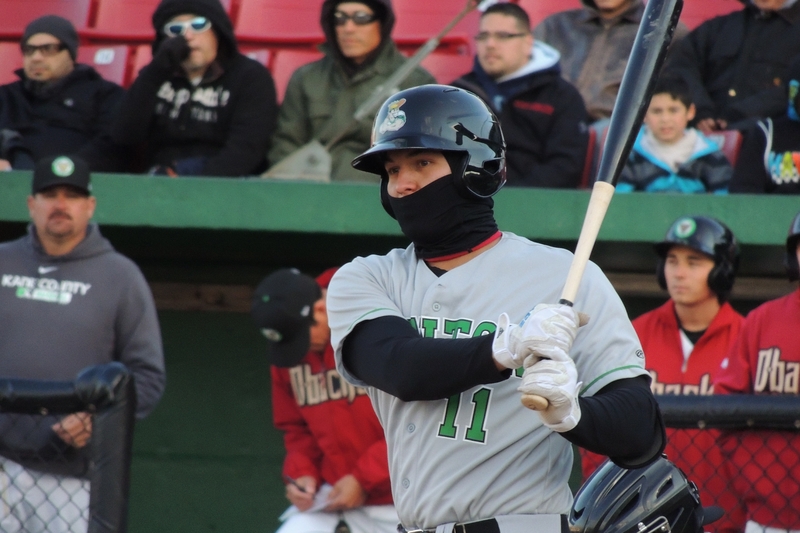 In that same game against the Quad Cities River Bandits, LumberKings third baseman Conner Hale went 4-for-5 with a double and a solo homer. At Kane County on Thursday, Arizona Diamondbacks prospect Zach Nehrir returned to the Cougars lineup with a bang. The outfielder went 5-for-5 with two runs scored against the Peoria Chiefs in his first game after spending two weeks on the disabled list. Cougars first baseman Trevor Mitsui also had a good game, going 3-for-5 with a double, a triple, two runs batted in, and one run scored. This entry was posted in Clinton LumberKings, Everett AquaSox, Kane County Cougars, Midwest League, Northwest League, Peoria Chiefs, Quad Cities River Bandits. Bookmark the permalink.